This year marks the 40th anniversary of China's reform and opening up policy, and the 15th anniversary of the China-European Union Comprehensive Strategic Partnership. It is both a time for commemoration and an opportunity to review the past and look to the future. In the past, common interests brought China and Europe together; for the future, common responsibility calls for more co-operation between the two. Against surging protectionism and unilateralism, continued tension in international trade relations, and rising instability and uncertainty, China and Europe, as two responsible forces for maintaining stability, need to enhance co-ordination and safeguard the rules-based multilateral trade regime. Both China and Europe have benefited from the multilateral trade system. Deeper economic globalisation and accelerated integration of industrial and value chains all over the world have increased the inter-dependence between countries in international trade. 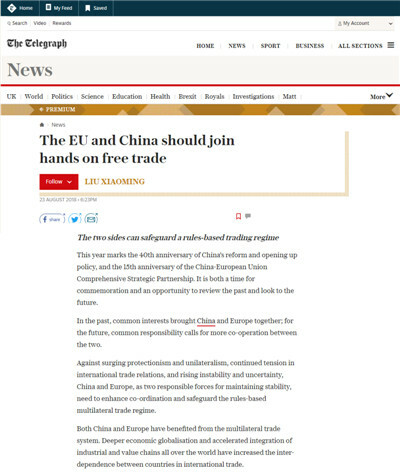 The trade and economic co-operation between China and the EU have grown rapidly thanks to the safeguard of the multilateral trade regime. Over the past 40 years, China-EU trade in goods has increased from less than $4 billion to over $600 billion; trade in services has grown from zero to over $100 billion; and the investment stock has soared from zero to nearly $200. The EU has been China's largest trading partner for 14 consecutive years, and China is the EU’s second largest trading partner. Without the multilateral trade system, such leapfrogging progress could not have been possible. China and Europe have not only gained from but also helped to create and build this system. They should therefore should take the lead in upholding multilateralism, free trade and the rules-based international order, and opposing protectionism and unilateralism. “Where light inches forward, darkness retreats.” Conversely, indulging in or yielding to the disruption of putting oneself before international order and its rules will only surrender the multilateral trade regime to the darkness of long night. It is therefore reassuring that at the 20th China-EU Summit held in July, both China and the European Union sent a clear message of upholding multilateralism and existing World Trade Organisation (WTO) rules, and opposing protectionism and unilateralism. An open, inclusive, transparent and non-discriminatory multilateral trade regime with the WTO at its core is in the common interests of not only China and Europe but also the whole world. Of course, the international trade regime needs to be reformed in accordance with the changing times. So does the WTO. Though not perfect, the WTO remains the most effective mechanism for multilateral trade ever established. It has the support of the majority of countries because it is rules-based, aims to be equitable and pursues win-win outcomes as its goal. The reform of the WTO could not be done overnight. Instead, the reform measures need to be rolled out gradually on the basis of consultation. China and Europe have actively championed reform in the WTO, having agreed to engage in co-operation and pledged to set up a joint working group on reform. At home, China will stay committed to deeper reform and further opening-up, and take concrete actions to make globalisation more open, inclusive, balanced and win-win. “Those who see the trend are wise and those who seize the trend will win.” Safeguarding the rule-based multilateral trade regime is in keeping with the trend of the times and in the interests of the whole world. China and Europe should join hands to follow this trend, implement the outcomes of the China-EU Summit, and contribute to the world’s prosperity and development.